You arrive in Kathmandu today where we meet you at the airport and transfer you to your hotel. Our rep will help you settle in and give you an introduction to the surrounding area. This morning we start with a walking tour from the tourist centre of Thamel, through Kathmandu's busy winding streets passing numerous tiny shops, workships and street corner temples to Durbar Square with its splendid array of Hindu temples and the old Royal Palace. We then drive up to the Swayambhunath Stupa and see great views over the city and surrounding valley. We pick you up from the hotel this morning and transfer to the airport for the spectacular flight over the Himalaya to Bhutan (try and sit on the left side of the plane). On arrival at the beautiful Paro airport, you'll really feel you've arrived somewhere very different and very special. After an introductory lunch, you visit Ta Dzong, originally the Watch Tower for the Rinpung Dzong in Paro and now the National Museum. We then walk down to Paro Dzong and learn about how these spectacular buildings have managed Bhutan over the centuries through a combination of monastic and civic administration. After an early breakfast, you drive to the foot of the Taktshang cliff just outside Paro, before walking uphill for 2-3 hours to reach this monastery, perched on a sheer 800m rock face. Taktshang is probably Bhutan’s most famous site and means ‘Tiger’s Nest’. You’ll break for lunch at the Taktshang Cafeteria about two thirds of the way up. The return trip to the monastery takes 4-5 hours and riding ponies can be arranged for most of the uphill journey if you wish. In the afternoon, visit the ruined Drukgyel Dzong and the 7th century Kyichu Lhakhang temple. In the evening you could enjoy a relaxing traditional hot stone bath to ease any tired limbs. Keen birdwatchers may wish to enjoy a pre-breakfast tour this morning and drive up to the Che Le La Pass for sunrise to look for the beautiful Blood Grouse and colourful Himalayan Monal. After breakfast, we drive over the Dochu La Pass (3050m) on steep winding roads through beautiful forests to the Punakha Valley. Here we have a short walk across the valley floor to the Chimi Lhakhang Temple, built by Lama Drukpa Kuenley or ‘The Divine Madman’ and renowned for blessing barren women with fertility. We also visit Wangduephodrang Dzong. After breakfast, you drive through the valley to the north of Punakha for a morning walk to Khamsum Yuelley Namgyel Chorten and along the banks of the river through mixed forest and past fields of chillies and other produce. 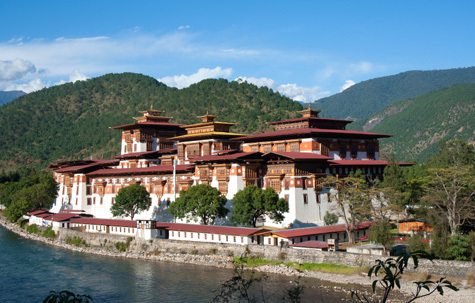 After lunch you visit the spectacular Punakha Dzong, which lies between two rivers known as Phochu and Mochu. Symbolizing masculine and the feminine co-existence, their currents are of different colours and they unite at this spot. Leaving the Dzong, you drive back across the Dochu La Pass to Thimphu (approx. 3 hours). In the evening we normally take you to a restaurant on the hillside with great views overlooking the city. After breakfast we visit the huge weekend food and crafts market, which is a great place to pick up a souvenir of your time in Bhutan. We then tour several sites and museums in Thimphu before making the short drive back to Paro. This morning we fly back to Kathmandu and transfer to the ancient centre of Bhaktapur. Formerly a capital of the Kathmandu Valley, the pedestrianised centre of Bhaktapur is full of squares and temples with some stunning wooden architecture. You have a tour here, as well as time to explore the narrow winding streets which bustle with life. In the afternoon we make a short drive uphill to the village of Nagarkot, which sits on a ridge at the north-eastern edge of the Kathmandu Valley. Accepted as probably the best of the valley’s mountain views, from the village lodges and hotels you can see all the way from Kanchenjunga in the east, past the tiny (from here!) peak of Mt. Everest, to Dhaulgiri in the west. After waking early to enjoy the sunrise views, we have a downhill ridge walk through the Tilkot Forest Reserve, tiny Chhetri villages and traditional terraced farmland to the somewhat crumbling but atmospheric Changu Narayan Temple. Before returning to the hotel, we tour the important Hindu and Buddhist pilgrimage sites of Pashupatinath temple and Boudhanath stupa. Another short flight takes us into Tibet this morning, where our Tibetan guide meets us and transfers us to the town of Tsetang. You'll really get a feel for the size and contrasting plains and mountains of the Tibetan plateau. We take the rest of the day easy to adjust to the increase in altitude. We start today with a visit to the Yumbulagang Palace, home to the early Tibetan kings. We then take an interesting and beautiful flat-bottomed boat trip for 1 to 1 ½ hours across the Bhramaputra (Tsangpo) river to Samye, the first monastery to be built in Tibet. Fully restored and rebuilt after being destroyed in the Cultural Revolution it is a great example of Tibetan religious architecture. We then drive on to Lhasa (3750m). We start today's tour with Lhasa's cardinal landmark, the Potala Palace. One of the great wonders of world architecture, it was the former winter home of the Dalai Lama and probably many people's main image when they think of Tibet. We then visit the Barkhor where monks sit cross-legged on the streets with alms bowls and the low murmour of prayers can be heard in the air while nearby stall owners offer jewel encrusted daggers with enthusiasm. Away from the square you can begin the Barkhor circuit including Mani Lhakhang (huge prayer wheel), Nangtse Shar (former jail and dungeons) before arriving at Jokhang Temple the spiritual centre of Tibet. There is also a collection of chapels that encircles the statues and pilgrims walk around this courtyard (always in a clock-wise direction) visiting the various chapels along the way. We continue our tour of Lhasa with a visit to the Norbulingka, the former summer palace of the Dalai Lama which served both administrative and religious functions in the past. We then travel to the Drepung Monastery, about 8 km west of central Lhasa and once the largest monastery in Tibet with over 10,000 monks. Around 5km north of central Lhasa, Sera may not be as grandiose as Drepung, but is more serene and surrounded by many small temples. Every day at 3pm (except on Sundays), the famous ‘Buddhism Scriptures Debating’ takes place in the courtyard as monks follow the teachings of the buddha to question everything they are told. They supplement their debating with a variety of gestures including clapping their hands, pushing their partners for answers and plucking their prayer beads. After an early breakfast, we transfer you to the airport where you depart Lhasa and fly back to Kathmandu where we meet you at the airport and transfer you to your hotel. The rest of the day is free. We leave the whole of the day free today for you to explore Kathmandu further or make some last minute souvenir purchases. While you can fly home today if you wish, we build this free day into the itinerary in case of delays or cancellations to the flight back from Lhasa to Kathmandu, which can happen when the weather or visibility is poor. Kathmandu valley sightseeing; Traditional Bhutanese life & architecture; Paro Dzong & National Museum; Thimphu sites; Punakha Valley including the Punakha & Wangdi Phodrang Dzongs; Lhasa tour including the Potala Palace, Jokhang Monastery; Boat trip to Samye Monastery. "We really enjoyed our trek to Everest base camp and would like to thank you for a well organised tour. We certainly would not hesitate to recommend your tours to our friends."